Online Casino and Bitcoin – The Perfect Match? Ever since the concept of Bitcoin was introduced just 10 short years ago, it’s been a rollercoaster ride. No one can quite tell where things are going. But, we’re certain about one thing – the number of Bitcoin investors has shown a steady rise. Cryptocurrency is happily being used across an array of sectors. But, there’s one area where it’s not taken off as quickly as expected, and that’s the world of iGaming, especially online poker gaming. Online Casino Gaming and Bitcoin Should Be a Heavenly Match, Right? Bitcoin is a phenomenon designed, very literally, for the digital age. So is online casino gaming. What with the speed at which deposits can be made with no need for an actual currency makes it a logical choice, you’d think. What’s more, the anonymity that Bitcoin offers is another appealing aspect for Kiwis. No one needs to know about who you are or how successful your gaming is. And, when it comes to poker players (or even the pokies), it’s this level of anonymity that fits in with the entire ethos of the game. In fact, it’s the central tenet of play to hide as much as you can from your opponents. Well, that may not be as relevant in the online gaming world, but the appeal of being undercover must surely tick boxes for many players. What’s more, the fact that Bitcoin can fluctuate significantly is such a short space of time should also appeal to gamers. If things are going your way, you could multiply your winnings by simply selling at the right time. The other key factor that seems purpose-made is that your transactions aren’t only secure due to blockchain technology, they’re faster. A big plus when you just want to get on with signing into your player account and get playing. So, why aren’t online poker and Bitcoin merging just yet? Possibly due to caution on the casino operator’s part. Teamed with this, the feeling that not enough players want in. On poker players part, many are wary of the negative publicity Bitcoin has previously received, as a result of some high-profile hacker attacks and the fear that the cryptocurrency is currently in an investment bubble that could burst at any moment, reducing its value a great deal. 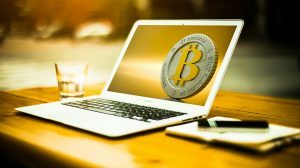 So, the prospects for online poker players and operators adopting Bitcoin remain somewhat uncertain. It could be that in a mere year from now, the debate just wasn’t worth having. Yet, it could still be up in the air. It’s difficult to judge. There is one thing for sure. Online poker players will continue to play and they’re always going to need some sort of currency (or cryptocurrency) to bet with.